Places associated with Bishop Butler, including locations of surviving manuscripts, buildings, artifacts. This cronological summary of Butler's life includes links to the individual locations, which follow below in alphabetical order. Butler was born in Wantage to a Presbyterian family. He attended a dissenting academy in Gloucester, later moved to Tewkesbury. After conforming to the Church of England, he became a student at Oriel College, Oxford. After taking his degree and being ordained, Butler's first job was as preacher at the Rolls Chapel (1719-1726), where he preached his Fifteen Sermons (1726), He also served as rector of Haughton-le-Skerne (1722-1725), until becoming rector of Stanhope (1725-1740). Charles Talbot, Lord Chancellor, presented Butler to the Prebend of the Second Stall in Rochester Cathedral (1736-1738). After publishing his Analogy of Religion (1736), Butler became bishop of Bristol (1738-1750). As a bishop, Butler served in the House of Lords and preached six "public sermons" in various London churches (St. Bridget, Christ Church, St. Mary-le-Bow, St. Lawrence Jewry, Westminster Abbey). Butler's finances greatly improved as dean of St. Paul's in London (1740-1750), and at some point he acquired a house in Hampstead Finally, Butler moved from one of the poorest sees to one of the richest, Durham (1750-1752), and took up residence Bishop Auckland. One of his charities was the infirmary at Newcastle upon Tyne. Butler soon became ill and was moved to Bath, where he died after the waters failed to cure him. He was buried in Bristol Cathedral. Presently part of Avon County, Bath was part of Somerset County in Butler's day. According to Forster-Benson letters, Butler was brought to Bath on June 3, 1752, and died there on June 16. An article appeared in the Bath Journal (June 22, 1752). Bartlett says Secker is supposed to be the author (194). Bishop Butler's table and silver coffeepot. Portraits. "There are two memories of him in this house. The one tells of his custom to sit in the glorious chapel on Sunday evenings, and hear the organ played by his secretary. The other records his admiration of the view from the window facing north. We have a silver coffee-pot which was his, and there is 'Butler's Walk' in the garden, where he built a wall as a shelter from a walk warmed by the southern sun." Presently part of Avon County, Bristol was part of Gloucestershire County in Butler's day. Butler was Bishop of Bristol from December of 1738 until he became Bishop of Durham in 1750. "The essay on Butler's ethics was first delivered as a public lecture at the University of Bristol, a city which seems hardly to realise how great a moralist and theologian it once had for its bishop." -- C.D. Broad (1930) xxiii. Butler's body was removed from Bath to Bristol and buried in the Cathedral on June 20, 1752. Dean Harrison's booklet (1984) states that the Butler memorial is in the North Transept, other guides place it in the South Transept. Those in authority at that date tried to improve on Southey's English by substituting the words 'subservient to' for the 'handmaid of,' but they might well have let it alone. Below this is Butler's own quotation from Origen." "The whole transept is disfigured by a collection of monuments, the greater part of which are of the worst style and period;... and against the east wall, a monument for Bishop Butler ... designed by Fripp of Bristol. The monument is of Painswick stone, ..."
in the Choir of this Cathedral. To the Heart of Man. Of Those WITHIN THE VEIL. "On the south side of Lady Chapel, close to Abbot Newland's tomb: [let into the wall below Abbot Newland's tomb] there is a modern brass plate with an inscription, copied from that written by Nathaniel Forster, Bishop Butler's chaplain. [copied exactly from his tombstone, on which it had nearly become illegible]"
MORTUI HAUD FACILE EVANESCET MEMORIA. 16 KAL: JUL. A.D. MDCCLII. Or in English: "Here lies buried the Rt. Rev. Father in Christ, Joseph Butler, LL.D., Bishop, first of this diocese and then of Durham. His own generation knew right well what manner of man he was; and if a great intellect, keenness of perception, self-restraint, piety, simplicity, frankness, generosity can increase his reputation as a Bishop or as a writer, his memory, though he is dead, will not easily fade away. He died at Bath on June the 17th, 1752, aged 70. He is buried close by." "He was buried at the foot of the Bishop's throne, which, in his time, stood slightly to the west of the present screen at the back of the reredos." -- Masse' (1901), p. 74. "Early in 1868 the foundation stone was laid underneath the pier of north-west tower, or, as it has been called since, Bishop Butler's tower. For years the work of building went on, and in October 1877, after a special appeal for funds had been made, the nave was opened for use with great ceremony, the opening services lasting for two days. The Bishops of Gloucester and Bristol, and Bath and Wells, together with the Deans of Canterbury and Westminster, took part in the services." "Scarcely had he taken possession of his new diocese, when he began to make great alterations in and about the Castle at Durham..."
--Bartlett, 193, see Hutchinson's Durham. There is a memorial to Butler with an inscription by Gladstone. Butler attended the dissenting academy here, later removed to Tewkesbury. Bishop Talbot was translated to the see of Durham in 1721 and in the following year presented Butler to the living of Haughton, near Darlington. Presently part of Tyne and Wear County, Houghton-le-Spring was part of Durham County in Butler's day. Bishop Talbot made Secker rector here in 1724. 1714 letter to Clarke from Hamblin's Coffee-house. "The conversation varied in different coffee-houses. ... Hamblin's, infant baptism, lay ordination, free-will, election, and reprobation; ..."
-- Ralph Nevill, London Clubs: Their History & Treasures (London: Chatto & Windus, 1911), p. 9. No information of where it was or what became of it. "Rolls House and Chapel, Chancery Lane, a place where the rolls and records of the Court of Chancery were kept from the reign of Edward III until the erection of the Record Office in Fetter Lane. Rolls House was the official residence of the Master of the Rolls, who also kept his court here. The Rolls Court was removed on the opening of the Royal Courts of Justice, and this building is now occupied by the officials of the Record Office. The master's house was designed by Colin Campbell in 1717-1725 at a cost of £5000, during the mastership of Sir Joseph Jekyll. The first stone was laid September 18, 1717. On the site of the present chapel Henry III erected, in the year 1233, a House of Maintenance for converted Jews (Domus Conversorum), but the number of converts decreasing from the enactment of Edward I, in 1290, by which the Jews were banished out of the realm, Edward III, in 1377, annexed the house and chapel to the newly-created office of Custos Rotulorum, or Keeper of the Rolls. The chapel has been greatly altered and disfigured. Prior to their removal to the Record Office the Rolls of the Chancery were kept in presses ranged along the walls of this chapel, under the seats of the pews, and even behind the altar." What very little is left of the Rolls Chapel is now in the museum of the Public Record Office. Originally the site was occupied by the Chapel of the House of Converts, i.e., Jews who became Christians, founded by Henry III in 1232. Since the time of Henry VIII the Keepers of the Rolls have been lawyers. Kent says the "actual custody of the records of Chancery was, moreover, delegated to others. The chapel then became attached to his official residence, and, not only a place of worship for him and his family, but for the masters, clerks, and registrars of the Court of Chancery and a meeting-place for the discharge or the foreclosure of mortgages. The preacher was practically a domestic chaplain, though occasionally special sermons were preached to large congregations." The chapel was rebuilt 1717-24 (Kent), which would correspond almost exactly with Butler's tenure, 1718-1726. Most of the records were removed to the new Public Record Office in 1856. The chapel was torn down in 1895. A surviving window contains the arms of four famous preachers at the Rolls: Stillingfleet, Burnet, Atterbury and Butler. "...in due course it became part lawyer's chapel, part record repository and part mortgage office"
--Weinreb and Hibbert (1988) 653. They also give dates of rebuilding as 1617, 1734, 1784. "After extensive rebuilding and repairs in the 17th, 18th and 19th cents., in 1895 it was decided to pull down the crumbling walls of the Chapel and erect a museum incorporating any remains of historical value ... J. Butler held the office of Preacher at the Rolls Chapel from 1718 to 1726 and delivered his famous sermons here. The records (Rolls) of Chancery were formerly kept in the Chapel." -- Oxford Dictionary of the Christian Church (2), the 1957 edition included the point that it was almost entirely rebuilt by Indigo Jones in 1617. "The present Chapel, in which Butler preached, is a small and gloomy edifice, in the Gothic style. It contains monuments to several eminent lawyers, in the costume of their times, and is attended chiefly by members of that learned profession. This may serve to explain why Butler ventured in his "Sermons at the Rolls" on points so abstruse as those which are there to be met with. However inappropriate and unedifying such discourses might be for a common audience, they would present no formidable difficulties to veteran lawyers who had mastered the subtile doctrine of "contingent remainders," or learned to follow the windings of an intricate suit in Chancery." "There is an entry in his memoranda book, of money collected at the Sacrament, at the Rolls Chapel, July 12, 1726, which is the last allusion to his connexion with that place ...." Bartlett (1839) 36. Resigned preachership at Rolls, early in the autumn,"
1736 July 4. Administers Sacrament of the Lord's Supper privately to the Queen, at Kensington -- Bartlett (1839) 40. 1737 October 2. Private administration of the Sacrament of the Lord's Supper to the Queen at Hampton Court. -- Bartlett (1839) 43. Open to the public, thirteen miles west of London. 1737 November 20. The Queen spoke on behalf of Butler from her deathbed. 1738 March 4 Hume tries to see Butler, but finds he is in the country. Consecrated Bishop of Bristol, divided his time between London and Bristol. -- Bartlett (1839) 88. From this time until his death Butler attended the House of Lords. 1739 February 16. Preached at St. Mary-le-Bow, Bow Lane and Cheapside, for SPG. The Society for the Propagation of the Gospel was founded by Thomas Bray (1656-1730) in 1701. The church was almost destroyed in World War II. 1740 Monday in Easter week. Sermon preached in St. Bridget before the lord mayor and governors of the several hospitals. This is St. Bride's Church, Fleet Street, and Bernard (1900) quotes Steere that the hospitals under the care of the Lord Mayor and Corporation were: Christ's Hospital, St. Bartholomew's, St. Thomas's, Bridewell, Bethlem, and the London Workhouse. 1740 May 24. Installed as Dean of St. Paul's; resigned Stanhope. 1741 Jan 30. Before the House of Lords, in Abbey Church of Westminster. 1747 June 11. Before the House of Lords, in Abbey Church of Westminster. 1741. Nominated his nephew and namesake to be rector of St. Paul's, Shadwell, a small parish by the riverside, between Ratcliff and Wapping. "He liked the place so little that he preached his first sermon from the text `Woe is me that I sojourn in Mesech,' etc. (Psalm cxx.5)—nevertheless he seems still to have been there when Lysons wrote in 1795. The old church, demolished in 1817, was replaced by the present one in 1821." 1746 appointed clerk of the closet to the king (George II) The King was especially moved by one of his sermons, but the text has apparently been lost. 1747 December 22. "Letter to a lady regarding church property", from London. This letter has been published in Gladstone's edition of the Works of Bishop Butler (1898), volume 2, and in Bartlet's Memoirs of the Life, Character and Writings of Bishop Butler (1839). 1748 March 31 Thursday. At St. Lawrence Jewry, Guildhall Yard, Gresham Street, before Duke of Richmond and governors of the London Infirmary. 1752 April 22 "... my house and ground at Hampstead..." -- Butler's will. "The eighteenth century had a great belief in the efficacy of water taken internally and medicinally, and all sorts of maladies were treated in this way. Rich men and women went off to Bath or Harrogate, the Wells or Bristol Hot Springs; others of lesser means patronised the spas near London. The most celebrated of these was Hampstead, which had two wells or springs of chalybeate water, one in Well Walk and the other in what is now Fitzjohn's Avenue. Hampstead was then a pretty rural place with fine new houses clustered round its church, and a beautiful wild heath covered with heather and ling. During the first thirty years or so of the eighteenth century it was a fashionable place. It had its Great Room and its Long Room, its balls and concerts. The inns and taverns advertised fine dinners, there were gardens where people could drink tea and syllabubs. Every Monday from March to November music and dancing lasted all day long. There was even a spot where duels could be conveniently fought in old Middlesex forest close to Caen Wood. The Hampstead Assemblies were famous after the waters had fallen into disrepute. The short stage ran from London to Hampstead several times a day. The horses of those who rode could be accommodated close to the wells, and inns and lodgings offered accommodation to such visitors as preferred to stay in the place." "During the latter years of Butler's life he resided, when attending his duties in parliament, at Hampstead, in a mansion which he purchased and retained until his decease." -- Bartlett, p. 190. Bartlett takes his description from Park's Hampstead. 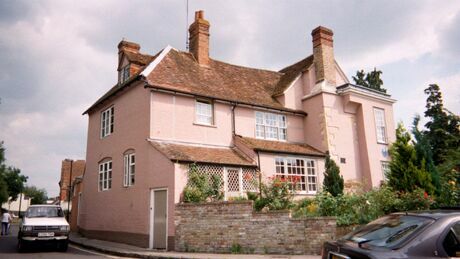 Official residence of the Archbishop of Canterbury. Library here holds correspondence with Thomas Secker regarding Butler's final illness, and a few letters signed by Butler. Presently part of Tyne and Wear County, Newcastle upon Tyne was part of Northumberland County in Butler's day. Victoria History of the County of Oxfordshire. The St. Thomas site mentions Butler and links back to this site. "Indeed, even at Stanhope the old historical rectory has been, if not wholly removed, so mutilated and "improved" as to give little or no ideas of the home of its most famous occupant." -- Grosart, "A Visit to Stanhope," Leisure Hour (1875). A parish hall very similar to Butler's rectory has now been build on the site. "At the top of High Street is a house known as the Old Academy, and the spout heads of whose frontage bear the date 1701. Such date may define restoration work, and such name retain some part of the history of its use, but the original structure no doubt can claim a much more remote relationship. The Tewkesbury Presbyterian Academy was first founded by the Rev. Samuel Jones at Gloucester, and transferred by him to Tewkesbury in the spring of 1712. Its course, in the very fact that Puritans of strong determination were associated with it, naturally was by no means a peaceful one, and several hostile scenes were enacted about its doors." -- "The Old Houses of Tewkesbury," 21. The Academy, now the Tudor House Hotel, preserves over the bedroom doors the names of such distinguished pupils as bishop Butler and archbishop Secker. Presently part of Oxfordshire County, Wantage was part of Berkshire County in Butler's day. The historically acknowledged birthplace of Joseph Butler. Butler was born in Wantage, Berkshire County, in 1692. The historic marker appears as a blue dot just below the window at the far right. The room in which he is said to have been born is at the far left. The family's residence was called "The Priory," and well into the nineteenth century mention is made of the room in which Butler was born being shown to visitors. See Bartlett. Spooner, p. 4, says it is still standing and the room where Butler is said to have been born is shown. Spooner calls it the Chantry. Butler attended the local grammar school conducted by the Rev. Philip Barton. Cameron (1952) has a drawing of "the old buildings, no longer standing, of King Alfred's School, Wantage, where Butler began his education." There is also some confusion about Butler's place of birth. According to Bill Fuller's "A Visitor's Guide to Wantage," Joseph's father did not lease The Priory, where he is usually said to have been born, until 1715. It is said that the room where Butler was born was "shown" during the nineteenth century, but it is not clear what records were used to identify the room. Whatever material the family had seems to have been passed down to the Butler's of Kirby House, Inkpen, and the portrait now in the Wantage Museum should be that by Thomas Hudson, which was once at Kirby House. The other Butler portrait that was once at Kirby House is the Vanderbank. The Auckland copy could not be located when I was last there, but I did see one (the original?) at Bristol Cathedral.